We have a hard time recommending the V5 because much better options are available for just a little extra dough. 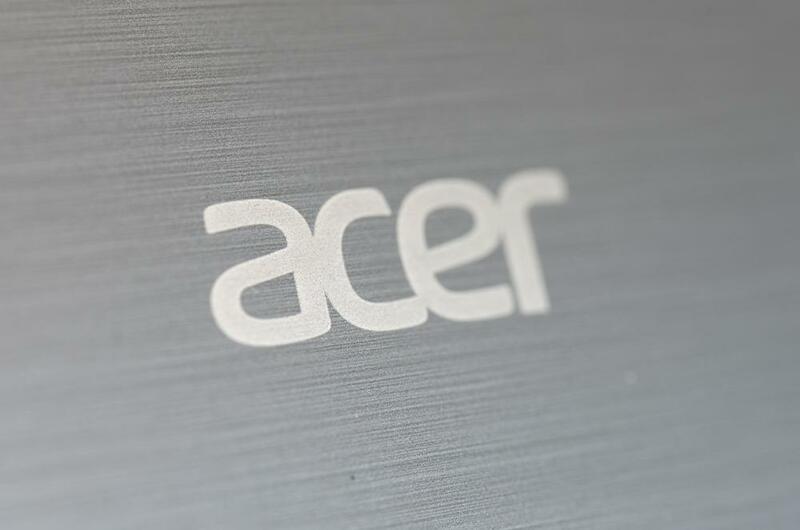 Acer has been on the front line of the Ultrabook’s march from the beginning. The Aspire S3 was one of the first Ultrabook products, and was among the most affordable. The Aspire M3 was the first Ultrabook with discrete graphics. 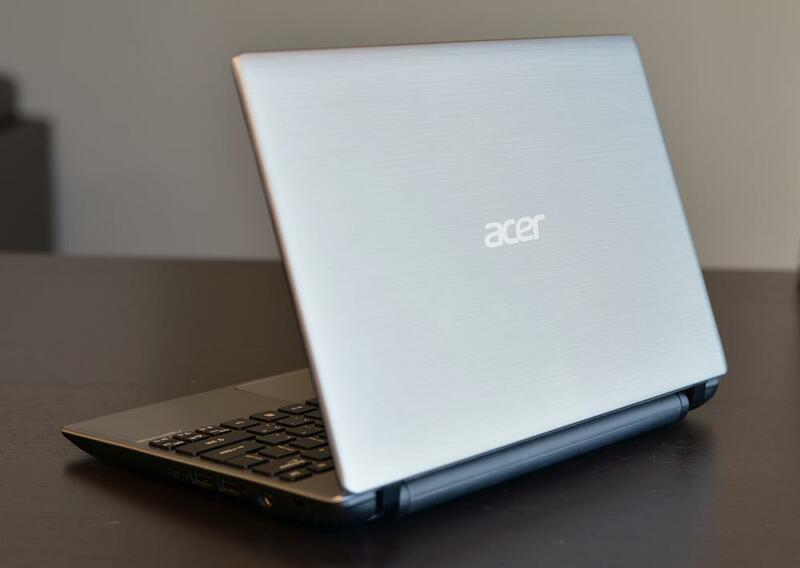 Acer refined that idea with the Aspire M5, one of our favorite Ultrabook choices so far. And then came the S5, a radical and expensive product that’s among the thinnest, lightest and quickest Ultrabooks available. But that doesn’t mean the company has abandoned the traditional laptop. Acer has been among the world’s largest notebook manufacturers for years, and still retains a diverse product line. So we feel little surprise that Acer continues to launch ultraportables even after it has thoroughly embraced the Ultrabook concept. One such laptop is the new Acer Aspire V5. The V5’s features, not its size, are what disqualify the computer as an Ultrabook. It lacks a solid-state drive, which means it has no Intel Instant On and Smart Response. This omission reduces the laptop’s price. Acer will sell you an 11.6-inch V5 for $549 – and the price includes hardware that is otherwise similar to an entry-level Ultrabook. An 11.6-inch laptop with a third-gen Core processor and a price of $549 looks promising on paper. Can the V5 stand up to real-world use, or has the low price required too many sacrifices? Let’s find out. Aesthetically, the Aspire V5 is thoroughly Acer. The company likes silver on mid-range models. This tradition continues by capping the V5 with a faux-aluminum silver plastic display lid and coating the interior in matte silver plastic. The computer is not luxurious, but it’s functional, and the materials are solid. Build quality is excellent. The laptop’s black plastic bottom and bezel hide panel gaps from sight. Users will have to look closely to spot them, and they’re small once discovered. No significant or unusual flex appears in any chassis parts. Connectivity comes courtesy of one USB 3.0 port, two USB 2.0 ports, HDMI, VGA and a combo headphone/microphone jack. This is a standard array of ports for a laptop of this size. We’d like to see an additional USB 3.0 port, but doubt most users will miss it. Acer has maximized use of the V5’s limited space. The keyboard is nearly edge-to-edge, which means it is on par with the keyboard sizes found on 13.3-inch laptops despite the V5’s smaller footprint. 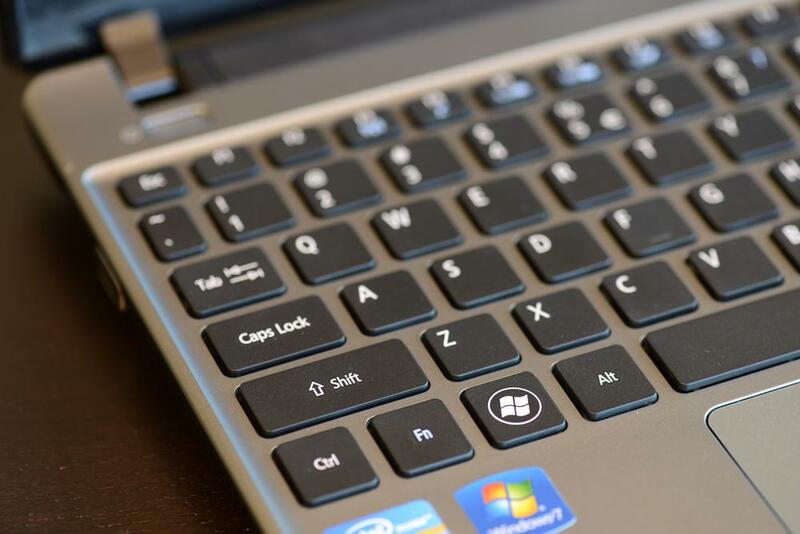 Some keys, such as the shift and backspace keys, are a bit undersized, but many 13.3-inch laptops do worse. Typists with large hands may find the palm rests too small. 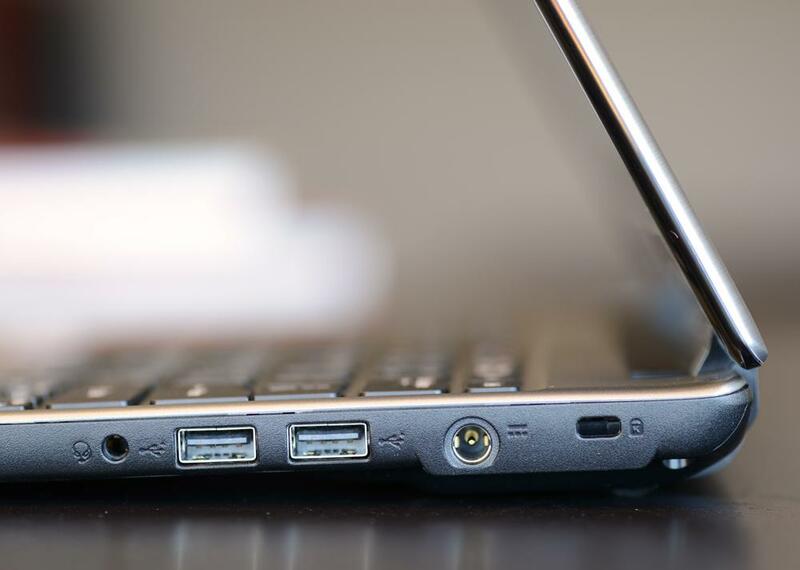 Although the keyboard is wide, the laptop is shallow, and designers sacrificed space below the keyboard to keep the laptop light. A cramped, uncomfortable typing experience will be unavoidable for some buyers. This is a side effect of the 11.6-inch display rather than an avoidable design flaw. 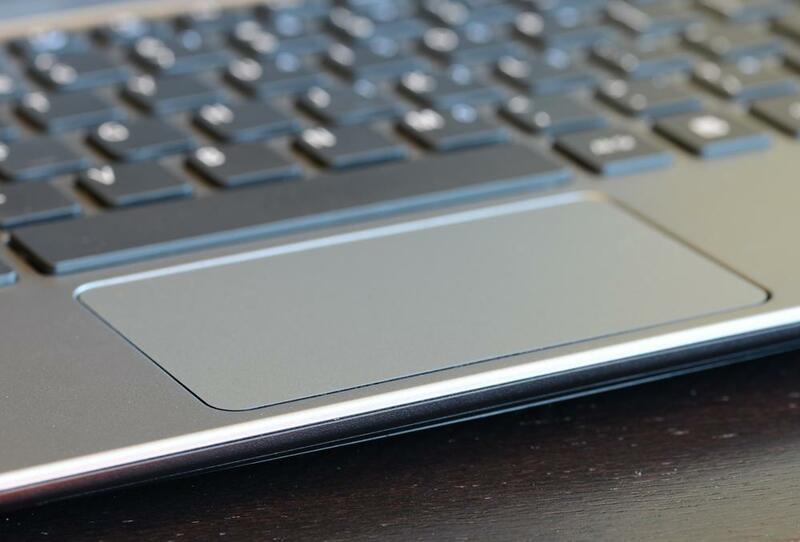 Space constraints also impact the touchpad. It is wide but not tall, making it one of the smaller touchpads we’ve used recently. Vague integrated mouse buttons, a lack of texture and poor multi-touch scrolling do additional damage to the user experience. Acer ships the V5 with a glossy 11.6-inch display. It offers a resolution of 1366 x 768 that, when crammed into a relatively small space, looks pretty sharp. Quality is otherwise unsurprising. Black levels are average, gradient banding is smooth but missing its darkest regions and perceived contrast is poor. The biggest problem is the display’s limited vertical viewing angles. Even the slightest tilt of the display can change an image significantly. These deficiencies are on par with other budget laptop displays, however. 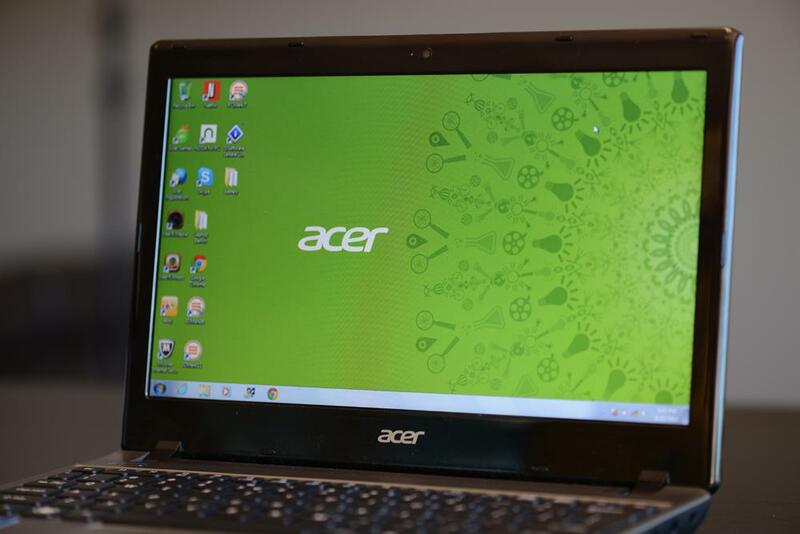 Acer is simply conforming to industry standards, which is to be expected on a laptop with a low price tag. Sound quality is extremely poor. The laptop’s small speakers struggle at maximum volume, which isn’t loud, resulting in significant distortion even in tracks that don’t pump up the bass. Lowering the volume solves the distortion but makes the laptop too quiet to comfortably hear in a room with moderate ambient noise. A pair of headphones or external speakers is mandatory for media enjoyment. Idle temperatures were no problem for the Aspire V5, which managed to post readings around 85 F at most locations. This is acceptable for a small laptop. Load changed the situation, raising temperatures as high as 105 F along the bottom and the keyboard. That’s uncomfortably warm. Fan noise was noticeable at idle, even in a room with low to moderate ambient noise. Load increased the volume enough to be noticeable in almost any setting. We also observed that the fan stays at high speed for considerable time after load is reduced. This is bad for users who dislike the whirr of a laptop fan. Acer’s Aspire V5 weighs a tad over three pounds and measures about .6 inches thick. These figures, combined with its 11.6-inch display and small chassis, make the V5 one of the most portable laptops on the market today. You can easily slip this computer into almost any bag with a laptop compartment. Acer sacrificed the battery to make the V5 thin and light, however. The V5 only comes with a four-cell unit, which is smaller than normal for a laptop. This small battery size negatively affects life. Our Battery Eater load test ate through the V5 in just one hour and 26 minutes while our light-load reader’s test turned in a result of four hours and 19 minutes. You will find better endurance from more expensive Ultrabooks and many multimedia laptops. The Acer Aspire V5, like most Acer laptops, comes with plenty of pre-installed software and shortcuts. This includes shortcuts to eBay, Netflix and Nook for PC, as well as pre-installed Skype, Google Chrome and utilities such Acer Games and Acer Registration. Most of this software is not bothersome because it’s nothing more than a Web shortcut. In some cases, the software actually is useful. McAfee security is pre-installed, however, and as annoying as ever. It constantly prompts the user for trial extensions, update installation and more. We recommend un-installing it and choosing a less obtrusive option such as AVG Free or Microsoft Security Essentials. Our Acer Aspire V5 review unit came with a Core i5-3317U processor, 6GB of RAM and a 500GB mechanical hard drive. This is a high-end variant. You can buy a V5 for as little as $400, but you’ll have to make do with a Pentium 967 instead of a Core i5. We’ve tested the Core i5 processor in other laptops before, so we had a good idea of what to expect. The V5 performed in line with those expectations by turning in a combined SiSoft Sandra Processor Arithmetic score of 34.75 GOPS and a combined 7-Zip score of 6,480. These scores are lower than Ultrabooks with the same processor, but the variance is so small it’s unnoticeable in real-world use. More relevant is the PCMark 7 score of 2,155. This is lower than the score on any other laptop we’ve tested in the past year. The slow mechanical drive and the lack of discrete graphics combine to put this laptop in a bad position. The results don’t improve in 3DMark 06 and 3DMark 11, which offered respective scores of 4,986 and 585. These are among the worst we’ve recently encountered and slightly below what we’ve achieved with other laptops that offer similar hardware. You can enjoy older games on this laptop, but new 3D games often will be too much for the V5 to handle. The Acer Aspire V5 is no powerhouse. It’s also doesn’t offer outstanding endurance, or a great display or groundbreaking design. The V5 is relying on two features: It’s inexpensive, and it’s light. These facts provide a reasonable argument for buying a V5. Few options exist in the world of budget ultraportables, and those competitors are going to have few significant advantages over the V5. Even so, we have a hard time recommending the V5 because much better options are available for just a little extra dough. You can buy Lenovo’s U310 for $50 to $75 more than the V5. Many other Ultrabooks are dropping into the $600 range when on sale. These products will be better for everyday use and, in some cases, are just as thin and light.